Venezuela was rocked this past Sunday by an attempted assassination of President Nicolas Maduro, during a public event, using drones armed with explosives. But as more details started to become available, the coverage of the mainstream media actually moved in the opposite direction: one after the other they have looked to sow doubt on the events, using words such as “apparent” or “alleged”, focusing instead on the government using this “alleged” event to step up repression. In the end, it is hard to tell apart the media coverage from the statements of John Bolton, one of the more hawkish advisers to the US president. 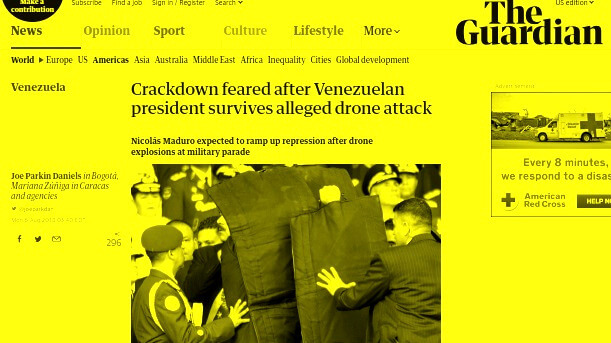 A screenshot of the Guardian’s coverage of the incident. The reactionary plotting against the Bolivarian Revolution by the Venezuelan bourgeoisie, their northern masters and the latter’s regional puppets, only now and then materializes into actual operations or terrorist attacks. But there is a constant set of background assumptions being created to endorse and provide cover for these actions, and this is achieved through the western media’s systematically dishonest coverage of Venezuela.